Apollo 11 launched three astronauts on the most significant space journey in history. On July 21, 1969, Neil Armstrong became the first man to set foot on the moon. The first man on the moon stamp was issued on September 9, 1969, in Washington , D.C. 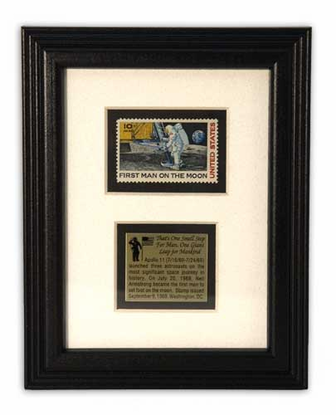 This framed first man on the moon stamp is a one of a kind collectible at an affordable price. Great gift idea!